One thing that’s somewhat hard to do over the holiday season is to stay healthy. We’re exposed to more people than usual, who are exposed to more people than usual . . . We get busy with shopping, baking, wrapping, attending various Christmas dinners and parties and then forget to take care of ourselves. The foods offered to us are rich, full of empty calories and very often foods our bodies aren’t used to eating in such large amounts. They and the alcohol are so tempting and fun. We end up losing sleep for these reasons whether it be from over-eating/drinking or worrying about that last gift we didn’t pick up. The next thing we know we have a) the flu; b) a cold; c) fatique; d) depression; or e) any or all of the above. We are sick. The December Alive magazine has you covered on how to take care of yourself. It takes a bit of restraint, but certainly will pay off in the end. Try adding a little soda water to your wine – make a spritzer. Make sure for every food rich with cream or sugar you eat you replace it with something green. Sprouts and shoots are great for this. Toss them into any salad. Sprinkle a few shoots over your bowl of soup. Bring sunflower shoots and/or pea shoots with you to your city friends’ home and impress them with how up to speed you are on the latest superfoods. Bring some to your country neighbour and relative’s tables to introduce them to a new nutrition source. Balance is the key to ensuring your body is being fed its fibre, magnesium (for sleep), and vitamin-rich vegetables and fruits. Keeping your stomach comfortably satisfied by eating slower, standing around the veggie tray instead of the chip bowl, grabbing a few almonds for energy now and again and generally listening to your body will help you maintain the best you for the entire holidays. Remember to drink plenty of water – drinking water is your skin and body’s best friend. If you’re entertaining, try to see that your guests are fed balancedly (you can use my new word). Throw some nuts and fruits onto that cheese tray. Try cheese on cucumber medallions instead of crackers. Make your own dips whenever you can to avoid those store bought sugar laden sauces and dressings. Eat organic whenever you can. The rule of thumb for most veggies is: if its organic – wash before eating it; if it isn’t organic, wash and peel before eating it. Think before you give. Is it local? Is it organic? Is it harmful to someone’s health? Perhaps giving a few little chocolates rather than a whole box is best. Fermented foods such as Phoebe’s Ferments are easily found here in Kemptville. If you are concerned about your own health or someone’s whom you care very much about, consider giving a gift of a nutritional consulation with Wholesum Approach. Heather’s Healthy Harvest and Nature’s Way in town can provide so many good-for-you stocking stuffers. All of us really care about you. Okay, enough rambling. The celery is done for this year, like frozen limp done. The basil plants I started are getting their second leaves. I’m letting them grow to sell to you in the new year if you’d like and to make pesto – I miss pesto. The herb bundles are ready for your stuffing. Pea shoots and Sunflower shoots are plenty this week, especially lots of the pea shoots. If you’d like me to make granola, let me know by Wednesday afternoon. I can do that Wednesday evening or Thursday morning. I’ll delivery to you Thursday. I’m also around Saturday morning if you need to pick up any last minute Day Brightener’s food. And I’m heading into Ottawa Saturday afternoon if you’d like something delivered to you in the Nation’s Capital. It can be arranged. In case I don’t see you before Sunday, I wish you a very Merry Christmas or any particular celebration you may be having. Stay safe and keep healthy. Do I pick greens before Friday and before next week? The answer is “yes”. A forecast low of -21C tomorrow night tells me clearly that we might lose those beautiful Greens out there if I don’t. So I will pick tomorrow. The shoots are ready when they’re ready. The sprouts are ready in the same fashion. Several of my decisions are made for me, but I do have a little control over some foods. Also, the fact that $10 worth of organic apples simmered down to one and a half jars of applesauce guides my decision that unless I can find organic apples for an incredible price or charge more per jar, I won’t be making and selling it this year. On the other hand, Tom spotted half-price organic bananas at Rainbow Foods on Sunday. Again, no problem with this one – banana “candies” are in the dehydrator right this minute. In the new year, we’ll be living off of indoor greens until the days get a tad longer. I have no complaint here as the warmth of the house is much easier on the fingers. I started the hot peppers January 26 this year. Our outdoor growing season is short as you know, so I’ll be starting the new ones the first week of January 2017. The rest of the veggie starts will follow accordingly, just earlier than ever before. I really need to get ahead of that first frost date in September next year. Some of you asked if I have tomato sauce for sale. A little more than half the amount of last year’s tomatoes were grown here this year. I sold almost all of them. There were none left to freeze either. I see this as a good thing, business wise. No worries, there’s always something else to grow – like sprouts, herbs and micro- greens. I can deliver to you this Friday and again next Thursday. I assume most people are off and running next Friday as well as I. I’ll start Sunflower Shoots and Micros today to be ready for your Christmas celebrations. There might still be Greens left to pick next week, but tomorrow’s Greens may last through the Christmas weekend. I’ll offer Onions, Dried Herb Mix for Stuffing and any available Celery at that time. Now it’s your turn. I can make the granola you choose. I now have pecans, almonds, cashews, walnuts and pistachios in the way of nuts. The fruits I have are cherries, blueberries, cranberries and barberries. Wow, google Health Benefits of Barberry – it’s an amazing fruit! Tell me what you’d like in your granola and I’ll make it for you. If you don’t have a standing order for Sprouts, please let me know right away if you’ll need any for next week. I need to start them Saturday to be ready for Thursday delivery. Thanks. Day Brighteners is a non-certified organic farm, where we practice sustainability and environmentally-friendly farming. We use non-GMO seeds and products and take pride in all we do. You are very welcome to drop by most days, but if it’s picking/packing/delivery day you take your chances on the tour. Calling or emailing first is a good idea. We do appreciate your business very much and would like to hear from you with any comments you have. So here I am wandering around the house aimlessly wondering what to do with myself – hang on, that’s not true at all. Every hour is packed full, it’s just not as rushed as in summer and fall. I dug out some sage, thyme and savory from under the snow yesterday, brought them in, cleaned them up and am drying them in preparation for your turkey stuffing in two and a half weeks. I’ve also been drying some hot peppers to grind them for powder. For the last few days I was clearing snow from the roof of the small greenhouse with the dome roof, shovelling, shovelling and shovelling. The new Greenhouse has a peaked roof and is eleven feet tall so I won’t need to clear any snow from that one real soon. All the onions that will be coming out of the field rows are out. They did start to re-grow in the ground so the plan is to plant them in the Greenhouse, hopefully tomorrow. I’m hoping that the ones we left will grow again in the spring. Organizing saved seeds is now a small part of my every day routine. AND every single day I check on the Greens we planted about a month ago. They are doing great! These Greens combined with the micro-greens growing in the house right now will make wonderful salads for us all at Christmastime. I could squeak a few bags out this week but it would take them too long to grow back. Me thinks the smarter thing to do is let all salad fixings, indoors and out, grow another week in order to provide you with some for the Christmas weekend. I’ll get back to you to see if delivering Friday the 16th or Wednesday the 21st would be best, or maybe both – we’ll see. The best thing going on here, besides the Sprouts of course, is the Shoots – Pea Shoots and Sunflower Shoots – which I learned are also called micro-greens. You taught me last week that you really love shoots so I doubled the amount I grew this week. Sunflowers take one week. Peas take two weeks. They’re growing under lights so they need air circulation and hydration one to three times daily so I spritz, water and fan at various intervals each day. I’ll make granola and applesauce this afternoon from organic apples I bought last week. Barkley’s tells me they have no organic apples left on their farm. They were very popular this year. I’m happy for that and hoping this will convince more growers to not spray their trees. I picked so much chard and celery for you last week, it’ll take them another week to recuperate. I started basil plants and will let you know when they’re ready. If you would like me to grow extra sunflower or pea shoots for you for the holiday season, let me know this week so I can plan that. any of which I might have some left after the pre-orders are packaged up. ... ...when you don’t take the time to follow instructions. It’s been a while since I grew sunflower shoots and pea shoots. We started moving them out to the greenhouse in the Spring to realize the chipmunks preferred the seeds we’d started in trays were better scattered in various gardens on the property, so we stopped growing them for the summer (a.k.a. active chipmunk time). We’re growing them in the house now on shelves, hopefully the chipmunks don’t get in and take over. I’ve not grown kale and arugula micro-greens before. They germinated a couple of days after sowing – exciting - then they started to grow too fast and fell over before getting their true leaves, the ones we eat - fail. So . . . back to the drawing board. We’ll try again this week and see what happens when I actually follow the proper directions for growing them – sigh. I noticed a blog from someone on my facebook about micro-greens. It was good to hear she also failed on her first attempt. Not so much her failure, but just that I don’t need to seek therapy now – it happens to the best of us. We provided some useful growing and cooking tips as well as loads of nutritional information for these and other fall foods. Here’s a confession. I have never cooked chard until last week. I’ve been growing and selling it for years but have not had the chance to actually cook it. It’s good, real good and now a main staple in our fridge, replacing the spinach I used to buy regularly for ourselves when mine wasn’t co-operating. The same was true about kale a few years ago, until I had an opportunity to eat it and we like it tremendously now. This summer, I sold everything picked so, aside from the kale salad at Tom’s birthday party at the end of June, we didn’t get a chance to have some ourselves until last week. Oh, I was able to buy up some organic apples at the Farmers’ Market on Sunday for a good price. I’ll be making new fresh organic applesauce this week. Salsa Verde is also on the list of foods to make before the tomatoes get bitten by frost. The arugula and spinach are growing v e r y s l o w l y in the field rows, but they are growing. I go out and give them a pep talk every day, they seem to be in pretty good spirits. The carrots are still enjoying living in the ground, maybe next week they’ll be big enough to come in out of the cold. The salad greens and mustards planted in the Greenhouse are doing well, but not in a hurry to grow, I’ll keep you up to date on those. If you ordered sunflower shoots last week, I’ll include them in your order this week. The pea shoots seem to be working on their own schedule. If you ordered them last week I’ll also include them if they choose to be ready. Garlic gets planted this week. Garlic $2 each If you’re buying more than 15 at a time, I’ll sell them to you for the recommended Organic Price Tracker price of $10 / pound. Tomato Sauce $6 500/mL jar: (tomatoes, onions, garlic, sweet peppers, hot pepper, basil and/or parsley and/or oregano all grown here, organic olive oil and sea salt) The sauce is sealed in jars and will keep for a year on the shelf. Day Brighteners is a non-certified organic farm, where we practice sustainability and environmentally-friendly farming. We use non-GMO seeds and products and take pride in all we do. When I need to buy ingredients for sauces I prefer to buy organic. If organic is not available I try to buy local. You are very welcome to drop by most days, but if it’s picking/packing/delivery day you take your chances on the tour. Calling or emailing first is a good idea. We do appreciate your business very much and would like to hear from you with any comments you have. I don't really mind the snow, if I don't have to go out in it. Snow tires on going on next Tuesday. But, tomorrow's high is 15C - it's hard to keep track. We've been pretty busy around here. I'll copy/paste the last couple of weeks' worth of emails to catch you up. We are saving seeds from both flowers and vegetables. It’s pretty time consuming so I’m really glad for this warm spell. It seems those plants which survived the two really chilly nights have sent out their SOSs accordingly. The last of their fruits have tried so hard to ripen and start new buds and flowers before their ending. Although some tomatoes on the vines grew larger, there just isn’t time for them to turn their true colour. So – we’re going to pick every unripe and green tomato tomorrow and make Salsa Verdi. I made this a few years ago and it was delicious. I’ll let you know in a week or so how that goes. We get pretty excited around here when we find a praying mantis on a plant or a mantis casing on a stem or stake in the garden. Well, this morning I bumped into one of those green girls on a hot pepper plant in the Greenhouse. She moved slightly so I didn’t harm her by mistake. I took a picture of her and what should peek around another leaf on the same plant but another green praying mantis! One thing I learned this summer is that we have green and brown praying mantids. They are one of the best predators to keep bugs at bay. I’ve never seen so many in the gardens as this year. Do you see her, upside down on the branch in the middle? Now see the one on the left as well - they are so wonderful. I have not taken educational courses on gardening, farming, horticulture, agriculture or any culture at all. I learn as I go, but have been learning for most of my life. I’ve always been fascinated by plants and how they progress in their lifetime and how you really have to neglect a plant for it to die on you. They are pretty self-sufficient and strong. The cold days and nights basically stopped the plants in the Greenhouse for a time being and then with the warm sunny days and with my help keeping them warm at night they’ve produced clusters of new leaves and sometimes flowers. That’s pretty cool, but cold is cold. When the temps drop drastically as they will in a few weeks, that’ll be it for the peppers and tomatoes. The cherry tomatoes are holding their own. It must be because they’re protected by so many leaves. The leaves are damaged now but the cherries do go on. We’ll pick all that we can for you tomorrow. Several of the pepper plants in the north Nightshade Garden have been frostbitten, particularly the rows on the west end from where the wind blows hardest. So that’s the sad part I spoke of several weeks ago. It is, however, time to move on with our next plans – some in the gardens, some inside the greenhouses and inside the house. Last week we seeded arugula and spinach in the east Roots Garden now that two rows of carrots and several turnips and beets are gone. Call me crazy but I couldn’t resist knowing how warm it was last Fall. The Chard and Kale are thriving. The pumpkins we didn’t plant are doing great. The last full section of carrots should be ready in a week or two and will taste wonderfully sweet from the cold nights they’ll have been snapped with by that time. Other than the sprouts which I’ll keep producing for you, I plan on experimenting with different types and growing more shoots and micro-greens regularly. I have the setup for starting seeds so I may as well use what I have rather than letting all that equipment sit for several months. I found out more about those carrots sprouts. Apparently they need to be treated differently than the other sprouts I grow so I’ll be working on that too. I must share something with you about the Quebec apples we bought last week. I peeled, chopped and cooked the first bag of about 100 apples last Tuesday. I emailed you with applesauce on the menu Wednesday and you ordered Thursday. After that Carol and I were peeling the next bag of apples and discovered a few had labels on them. We’re at a loss as to why the person packing these bags would have put store bought apples in the mix. Was it to top up the bags? We wonder if all the apples were store bought which would make no sense or money for them. All I can say is that the first bag had no labels and no evidence they were store bought. I do apologize if this freaks you out since the labelled apples are not organic. When I buy apples during the winter months I buy as many organic as possible, next I turn to local, either Ontario or Quebec. I was told by Niagara Region fruit growers at the Ottawa Market that this spring was so dry they didn’t really need to spray for bugs, so I’m going with this thought and hoping our apples were as good for us as we’d like. If you know of anyone nearby growing organic apples, please let me know. You may not believe this, I hardly do. We have Salad Greens this week. Removing the old patch of Greens has been on my To Do List for weeks now but no one has had the time to actually do it. Lo and behold I was watering in the greenhouses and spotted the Greens patch and it looked so lush I plucked a few leaves, bit into them, then picked some more, added some flowers and herbs and sorrel, washed them and drizzled some balsamic vinegar over the whole affair. Tom and I tested them for you at supper and they taste fine. The thing is the little Salad Greens are only picked for about three weeks, a month tops, before they start to taste bitter. We then move on to the next available patch of new leaves and keep up the routine as such. This particular area of Salad Greens had its leaves come to an end many weeks ago BUT with the lovely cool nights and all the warmth we’ve been having new leaves have sprouted from the old stems and they’re as good as if they were from fresh seeds. Again I say “go figure”. I say that a lot. We have a new Dine and Discover dinner scheduled – it’s Saturday October 29, 4:30 p.m.
Every day I try to bring a dish down to its simplest form. This is the best one yet. When I roast the tomatoes, onions, garlic, peppers and herbs in olive oil and a bit of salt for our tomato sauce, I now save the “juice” drained before the veggies go into the food processor. I used to throw it out. What a waste. Last night I made tomato rice soup. It’s so easy, it’s brilliant! 1. Pour a jar of tomato sauce “juice” into pot. I now call this tomato-based vegetable stock. 2. Add one cup of cooked rice of your choice. 3. If you’re not vegan, toss in that parmesan cheese rind you have in the freezer, remove it before serving. Ta Da! That’s it. The flavours are already in the stock, the rice is delicious and the cheese rind makes the soup somewhat creamy. Serve this with a salad and a slab of hearty bread and you’ve got a good meal. Don’t get me wrong. I really enjoy cooking and trying new extremely complicated recipes with ingredients I may not have on hand. But who has time for that during busy week nights? This is what our Dine and Discover dinners are about – making sure you don’t feel stressed about cooking or by not having a long list of ingredients in your cupboard. If you haven’t been to a Dine and Discover, we show you the easiest way to get the nutritional value from your meals. We cook a lot of what we grow here at Day Brighteners Farm or what’s in season from your local market. Carol gets into the nitty gritty of what particular nutrition is in each item and why certain foods should be eaten together, why you should eat a variety, basically keeping your food intake in good balance – it’s all about the gut. We’re looking out for you and want to help in every way we can. I must say that I absolutely love it when you write back to me. It tells me you read my emails, which is terrific. And you provide such interesting information and advice. We all learn from each other. Thank you for that. We’ve had more praying mantis sightings as well as their casings on various items, including one on a pepper. It fell off so I’ll keep it out of harm’s way over the Winter and hope for the best come Spring. I learned today that marigold flowers are no longer flowers after cold weather. I saved so many seeds on the weekend, we’re good for a long while now. The ones in the greenhouse are still blooming like it’s August. They’re so pretty. I’m spending most of my days at the kitchen counter chopping, sautéing, roasting and canning. I miss being outside. I do, however, open the greenhouses each morning and study what’s growing on in there like the chard and celery, cherry tomatoes, hot peppers, some kale and I walk the garden rows whispering farewell to the once-luscious tomato and pepper plants and congratulate the hardy beets, chard, kale and turnips in the field for staying strong and the arugula and spinach for beginning. I spend an hour at each day’s end free-ranging with the chickens. I rake up some leaves and they follow me around picking worms. We have five broody girls out of twelve hens right now and we get two eggs per day from the eight non-broodies, yes I said two – good grief. The Salsa Verde turned out great. Green tomatoes don’t require the urgency of getting them cut and cooked as much as the red ones. They’re not going anywhere very fast, so we’ll keep making the Salsa as long as we have the green tomatoes we picked. Here’s what to make next, this is a real thing – Nasturtium Pesto – so many leaves, so many flowers. Stay tuned. 9:30 a.m. Should I go out to look? I don’t know. It can’t be good. I believe I picked the very last of the Cherry Tomatoes in the Greenhouse yesterday. It was 30C in there by late afternoon yesterday when I was closing up and the tops of the plants had been bitten by the cold and were looking pretty sad. I pulled off the many Hot Peppers that were either turning red or were of substantial size that they will turn red in the house. Despite the rain which flooded the floors of both greenhouses on the weekend, I still need to water in there today or tomorrow. Last Thursday we planted several sections of Mesclun Mix, Cress, Green Mizuna and Ruby Streaks Mizuna, hoping they will be ready to eat next month. We also sowed three kinds of Carrots and two types of spring Onions which should be ready in February or March. Talk about planning ahead, eh. Indoors, we started Sunflower seeds and Peas for Shoots, Kale and Arugula for micro-greens. These might be ready by Friday, it’s a guess at this point. How about I add them to the list, if you order them and they are available, you’ll get them. If they are not ready, then I’ll get them to you next week. I’m not in the indoor planting routine quite yet. It looks like everyone, except Arlington Five, is taking a break from sprouts this week. I do grow the Sandwich Booster Sprouts regularly each week and most likely have an extra bag or two. Let me know if you’d like to order some. Otherwise, I won’t grow the other kinds unless you specifically order them, for now. The Spinach and Arugula in the field rows are growing wonderfully. I think the next week or two might be the time to start cutting them for our meals. The Kale is good and the Carrots need a little more time to grow. Here’s what I learned since last email: written under Arugula on my seed packet is “The original love potion, Aphrodisiac of the Ancients”. Well, it’s no wonder dining is Montreal and Quebec City is so wonderful, they put Arugula on every plate of food. Even the mid-month Food & Drink magazine has it on an apple dish. It’s a fact that we are meant to keep moving. When I’m out walking or running from garden to garden, yanking up weeds, dragging around 200 feet of garden hose, pulling a garden cart of freshly picked veggies or hauling bales of straw from the van to the chicken coop I feel absolutely wonderful. When night comes and movement is halted by dinner, Netflix, reading or that darkness-inspired tired – that’s when the stiffness sets in. Now is the time to get back to The Workshop Dance Studio to keep moving. Tonight is the night to start back into the Aerobics. Tom and I both enjoy the Saturday morning class too. It sets the pace for the rest of the day, leaving us invigorated and ready to take on the world, or maybe a small corner of it anyway. We’re also looking forward to the Thriller Dance Class October 31st. 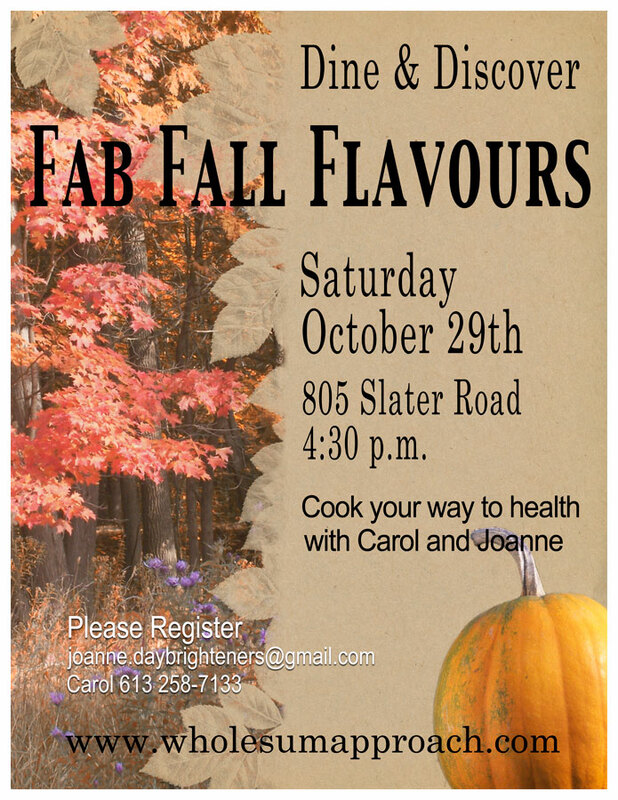 We have a couple of spaces left for the Fab Fall Flavours Dine & Discover taking place here this Saturday, October 29 at 4:30. See poster attached for details. The cost is $25 which includes Soup, Main Course and Dessert focusing on fall harvest plus some time-saving cooking tips. Carol Pillar is a Registered Holistic Nutritionist with her business, Wholesum Approach, and will be providing excellent health-wise advice for each item during the meal. 11:00 a.m. I did check on the Greenhouse. The cold has snapped the tops off the cherry tomato plants so there will be no more cherry tomatoes this year. We had a pretty good run with them though. I do, however, have about 50 pounds of green tomatoes if you’re in need. The salad seeds we sowed last week are just starting to germinate so I covered them to keep them a bit warmer since there’s no sunshine today. Hooray for Salads-to-be.